Fully rebuilt in 2009 with a Community Block Development Grant, the town’s public landing is Isle au Haut’s arrival point and place of departure: it’s the pulse of the island. The landing also provides a certain amount of exercise and recreation—from lugging groceries and belongings up and down the ramp, to taking a plunge into the thoroughfare (intentionally!). 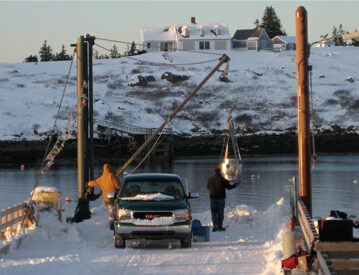 Year round the dock is visited by the Sunbeam bringing telemedicine to the island. Finally, the landing offers the best chance to sit and pass the time of day with Bernadine Barter, Isle au Haut’s official greeter.